I love this cute little Hero Arts heart butterfly woodblock rubber stamp. I have done gold embossing and some coloring using copic markers on the vellum. Thanks for dropping by today. Hope you had fun and got inspired. Dont forget to play along with our new challenge Personlize. Thanks to our generous sponsor Simon Says Stamp who is giving one random winner a gift voucher of $25. Hi, Jessica here with my first solo post! Originally I was planning on making a card using one of my large Hero Arts background stamps but I found a new stamp and ended up going in a totally different direction. I had stopped at Michaels to look through their Christmas clearance and saw the Hero Arts International Skyline stamp on sale. It was an interesting stamp but I couldn’t think of how I might use it so I decided to leave it behind. Then I headed off to Target and was wandering around when I saw this pallet artwork. I was convinced that it was a quote from the Pixar movie “Up” and a quick google search in the middle of the store turned up a ton of Etsy art prints with the balloons and the same quote underneath*. Looking at the sign gave me a great idea for an anniversary card using the stamp I had left behind at Michaels. So I headed back to Michaels and the stamp wasn’t there anymore! I was so mad at myself for leaving it behind; but as I was walking past the registers, I saw it sitting on one of the counters. I asked the cashier if it was being held for anyone and she told me that her last customer had changed her mind at the last minute and she just hadn’t gotten around to putting it back on the shelf! It must have been fate! Anyway, after that long backstory, here’s my card! 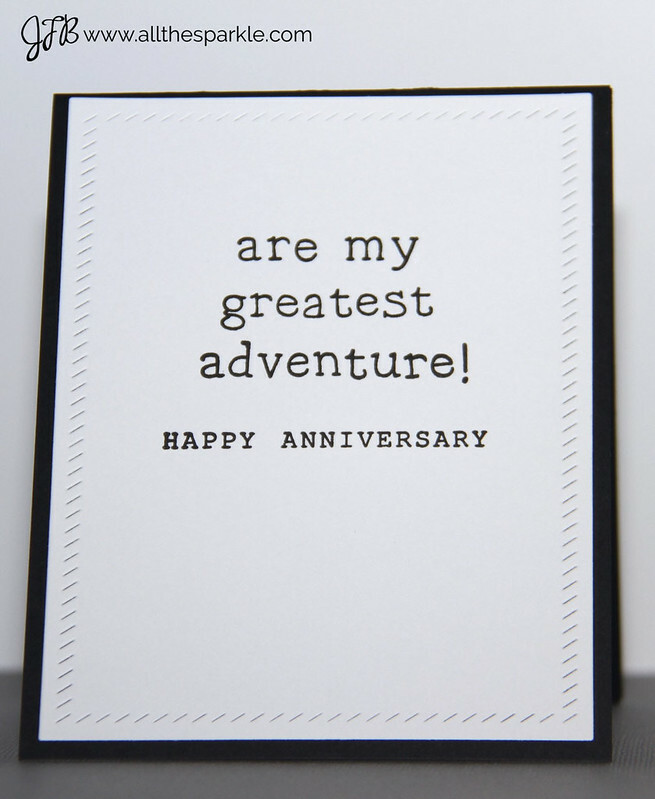 I created it as a 6th anniversary card for my amazing husband! We’ve only been to one landmark on that stamp (the Space Needle) but I hope we’ll check off more over the years to come! 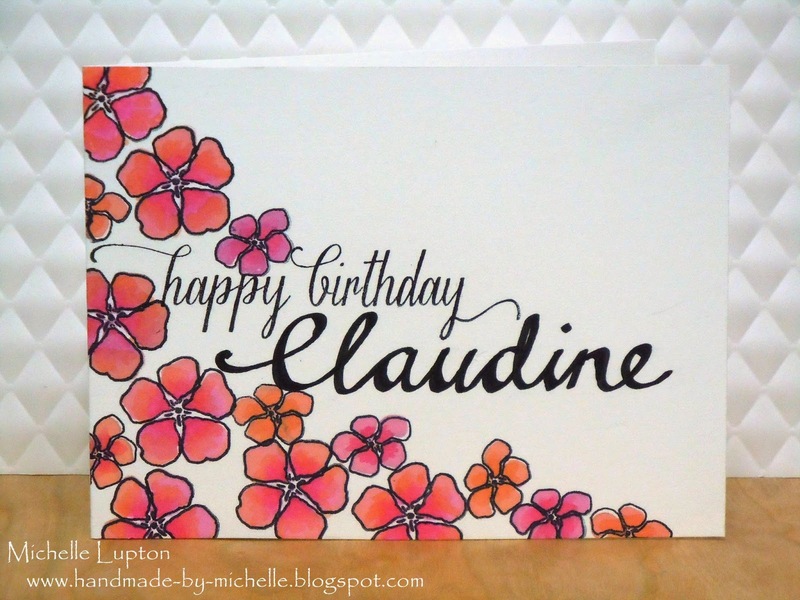 I started off by blending distress inks onto a piece of Neenah Solar White cardstock. I used the following colors from the bottom up, Squeezed Lemonade, Wild Honey, Dried Marigold, Picked Raspberry, Festive Berries, Shaded Lilac, Salty Ocean, and Chipped Sapphire. After they had dried completely I tore strips of scrap paper into cloud “stencils.” I taped those to the card with post-it tape and blended the same distress inks onto the card but made sure they ended up a little darker. 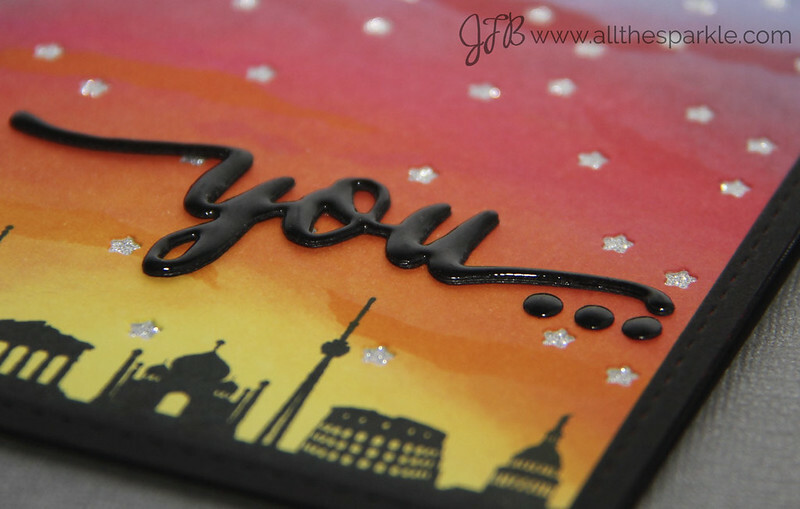 I stamped the Hero Arts International Skyline stamp onto the bottom of the card with Versafine Onyx Black ink. 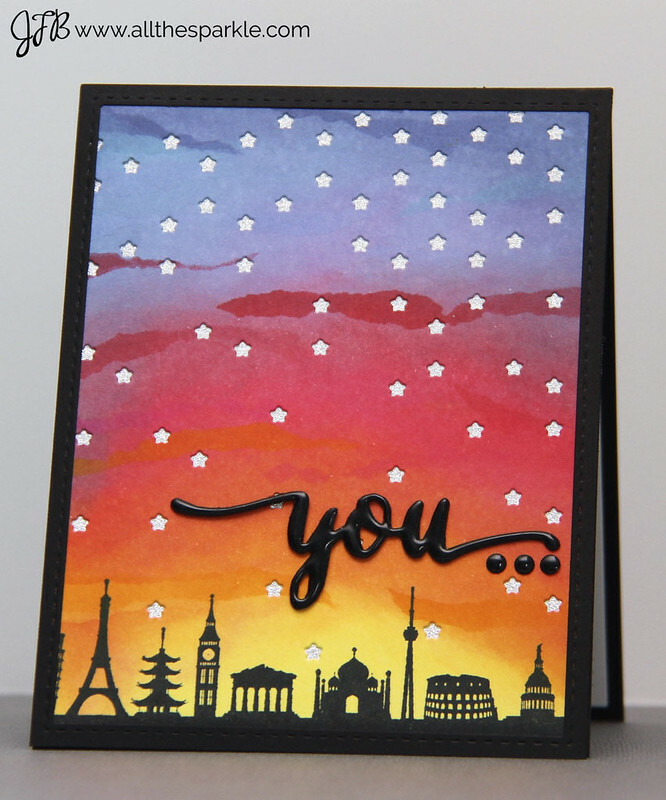 I wanted the sky to look like a sunset where the stars are just starting to come out so I ran the piece through my BigShot with the Simon Says Stamp Falling Stars die. 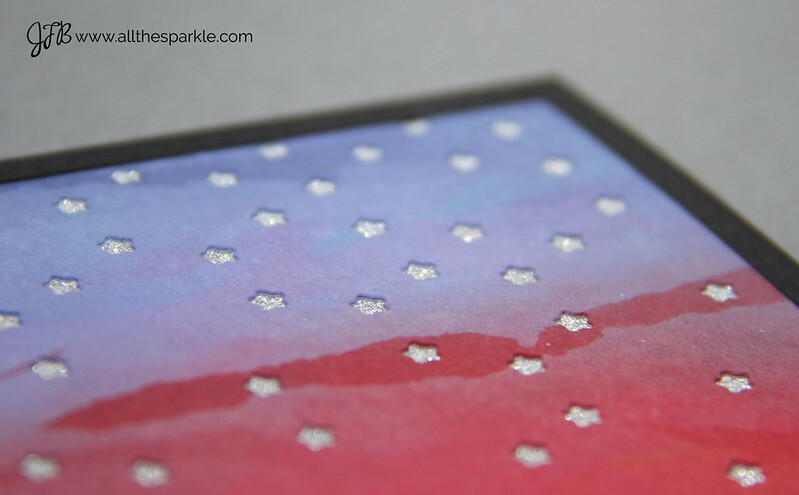 I layered a piece of silver glitter cardstock under the card to give the stars some shine. I cut a frame from the Simon Says Stamp Stitched Rectangles die and attached it around my card. Then I adhered the piece to a black top-folding card. I die-cut the word “you” from the WPlus9 Hand-Lettered Thanks set four times and glued them on top of each other. Then I pressed it into versamark ink and heat set it with Wow Ultra High clear embossing powder. I punched three small circles for the ellipses and used the same embossing powder for that high raised effect. For the inside I used the larger frame from the Avery Elle Finished Frame die set to cut the white panel. Then I used Smitty’s ABCs from Lawn Fawn to spell out the end of the sentence and stamped the Happy Anniversary sentiment from the Happy Everything set from Mama Elephant. Thanks for visiting today! Don’t forget to play along with our latest challenge, Personalize. Our generous sponsor, Simon Says Stamp, is giving one random entry a $25 gift voucher! Hi, Hiya and Hello everyone. This is Gayatri here with my first solo post for A Blog Named Hero. Today I have a card for you combining some old and new Hero Arts stamp sets. I absolutely love this new stamp & cuts set called The Fox Says. I adore the fox images in this set. I also have a few older Hero Arts stamp set which I have not used for a long time. One of my goals for this year is to use my older stamp sets as much as I can on my cards. So why not combine the old and new to create something unique. First here is my card. Can you spot the older stamp sets I have used in the card? Yes! They are the Leaf Cluster cling stamp set and the Starburst background cling stamp set. The leaf and grass border image from The Fox Says combines beautifully with the leaf cluster image. And the star burst image on the tag with the heart die cut draws the eyes to the sentiment. I wanted to used muted earthy colours hence used Soft Olive, Soft Vanilla Hero Arts Shadow inks. The foxes are stamped and coloured with copic markers. Then hand cut them out and adhered with foam adhesive for some dimension. I have brushed the Starburst image with Wink of Stella for some shimmer. You can see the shimmer in the photo below. Finally I have accented the card using some wood enamel dots. Hope I have inspired you to use some of your older Hero Arts stamp sets. Try and combine them with newer sets and get maximum use out of them. Don’t forget to join us in our current challenge – Personalise. There is $25 gift certificate to be won from our fabulous sponsor Simon Says Stamp. Hi all! Here is my first solo post (I am nervous!). I don´t know if you heard about doodle or doodling (or even zentagle) but it was a trend last year. It is an artistic way of expression that we have been doing all our student life. Do dou remember yourself drawing anything while you were in class? Or even in a meeting? That´s a doodle. I wanted to mix it with stamping and here you have the result. I made three cards with different words using the Journal Letters stamp set by Hero Arts. Let´s see the steps. I used Spectrum Noir Markers for colouring. For that reason I stamped the letters with Memento Tuxedo black ink, which is good for alcohol markers. If you need some help with lines like me, just draw some with a pencil that you will erase later. Once you have the whole panel, start doodling some of the words. When I have some of the word done, I start colouring to keep going. And here you have the card finished. What do you think? 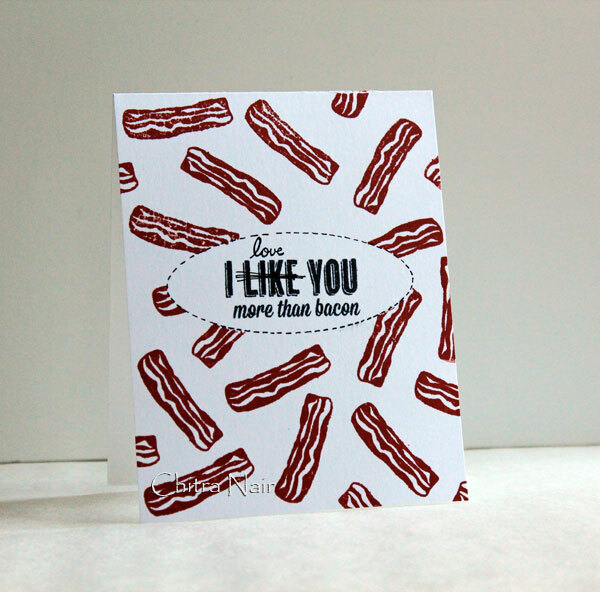 As well, these cards match with the current challenge at A Blog Named Hero about personalizing your cards, check it out! In my opinion, I like to personalize some stamping with a personal creative art. And there is no limits. Let me know if you try it! Thanks.